You have got to wonder why people spend so much on a lump of metal with four wheels attached to each corner. At first it seems a bit daft, when all we want is a means of independent transport to get us around. I guess doing well in the Western world is also about self-gratification and having an easy life. Let’s face it; we would rather have a cool, plush motor to ride around in than a jalopy. And that desire for pleasure-seeking can override the practical side of us (what bank balance?) when we are choosing a car. Some of us seem to not worry about practicality either. I mean, in the UK we buy more convertibles than many other countries in Europe! Why, when most of the time our country is damp and overcast? Speaking of open-top motoring, the all-new Range Rover Evoque Convertible has just been launched. The new sport utility vehicle (SUV) takes some getting used to, but it grows on you. As the fifth member of the Range Rover family unit – and the first ever convertible – Land Rover says the fresh model will play a key role in continuing Range Rover’s 45-year success story, pioneering an all-new SUV sector. If industry experts’ predictions about a 20 per cent growth in the global SUV market over the next five years prove correct then, indeed, the auto maker has nothing but sunshine heading its way. The Evoque Convertible has a fabric roof that can be activated on the move as long as the car isn’t doing over 30mph. The five-layer rag-top will drop in 18 seconds and it will raise in 21 seconds. The Evoque will seat four-up and, for a soft-top, it has a decent 251-litre boot too. The other nice thing is that the roof opens and closes quietly and it folds away tidily, instead of stacking-up on the tailgate. Inside, the massive 10.2 inch InControl Touch Pro nav is attractive – and, more importantly, it works really well. Truly, the “pinch-to-zoom” function is as quick as an iPad. You can choose either petrol or diesel, supported by turbo power. This is all hooked up to a slick nine-speed automatic gearbox, and all-wheel drive. The 2.0 oil-burner is the best for economy, managing 49.6mpg. The diesel version does 0-62mph in 10.3 seconds, which is 1.3 seconds behind the Coupe, but both do 121mph. The 237bhp petrol is quicker, sprinting from 0-62mph in 8.6 seconds. On and off-road, the soft-covered SUV seems just as accomplished as its tin-topped sibling. 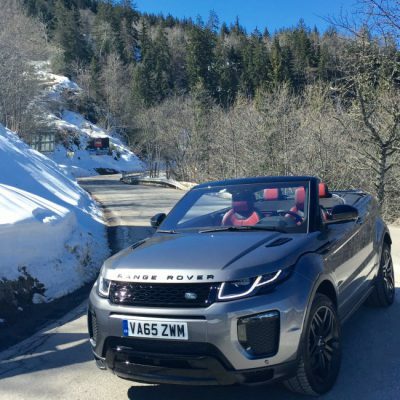 Indeed, at the car’s media launch in the French Alps, the Evoque eased up, down and through everything requested of it – including snow. Prices begin at £47,500, which is £5,200 more than a comparable hard-top Evoque Coupe.